The first blockbuster of the year is here and word on the street is that it’s… Shyamalan. Pure, underwhelming, borderline maddening Shyamalan. It’s sad, really. The pendulum of his goodwill in Hollywood was practically at a full upward swing, and this was the moment that would make or break him. Well, just like the title of his latest clunker, it appears Shyamalan’s reputation is about to shatter like glass again. After a brief period of greatness (1999’s The Sixth Sense, 2000’s Unbreakable and 2002’s Signs) there was a loooooong period of inexplicable garbage (2004’s The Village, 2006’s Lady in the Water, 2008’s The Happening, 2010’s The Last Airbender and 2013’s After Earth). Then came 2015’s The Visit, which was touted as Shyamalan’s grand return to form. It’s funny when you think about it, though. Is a $65 million grossing film with a 66% positive rating a return worth bragging about? On a $5 million budget, yes, it’s huge. How about on a normal budget with a director that isn’t working for pennies? No, probably not. It’s not until 2016’s Split that true forgiveness was awarded to him. 76% positive reviews is great after the dozen years of torture we went through and $138 million is a great total by any standard for a film costing only $9 million. Even more important than its critical reception or gross profit was its connection to one of Shyamalan’s prior films, Unbreakable. We all thought Split was just about James McAvoy killing teenage girls with his multiple personalities but, as it turned out, it has one final scene at the end that placed McAvoy’s “Beast’ character in the same world as Bruce Willis’ superhuman in Unbreakable. In that film, Bruce is crazy strong and his nemesis, Samuel L Jackson, is very weak. The catch was that he was fragile (like glass) but smart as hell. Willis is Unbreakable and good, McAvoy is Split and crazy, and Jackson is Glass and the ultimate evil mastermind. Together, these three will merge storylines for this unexpected trilogy capper. Nobody knew Shyamalan was making his first sequel with Split and suddenly, only three years later, we have the next installment in this full-fledged franchise. Though the title insinuates the film will this time focus on Jackson’s character, posters and trailers suggest this is a true team-up feature with all three sharing the spotlight. We had previously hoped for the best and are now hearing it’s the worse, but like most fans of the genre you probably already have your mind made up if you’re going to see it or now. For now, all I can do is my part in helping you prep for this highly anticipated, poorly reviewed first blockbuster of 2019. With that you have David Dunn (Willis),the guy that can’t get sick and is super strong. Balancing Dunn is Elijah Price (Jackson), a man with ultra-breakable bones that could die by the gust of wind. To give Prince something to brag about, and to further emphasize the nature of balance, he is extremely intelligent and uses his gift to cause destruction until he can sift through the masses to find his unbreakable counterpart. Once he does, he makes it his mission to find Dunn’s balancing weakness. How do you kill someone that can’t be broken? You drown him, that’s how. Nobody is all-powerful and nobody is completely helpless, and Unbreakable does a surprisingly good job at giving this spin to the classic superhero genre. So yeah, ok, Willis’ Dunn character can touch people and sense their thoughts, which is sort of a superpower and means Unbreakable is set in a world that is ever-so-slightly not realistic. But that was almost twenty years ago, and in that time we’ve had countless crappy Shyamalan films and a whole fantastic Marvel Cinematic Universe. Times have changed and people forgot all about “that guy that directed Sixth Sense” and now only care about “where the dusted people went that Thanos snapped away.” There was a blip a few years back that got our attention and that was the surprise reveal that a movie about Split Personality Disorder was connected to the long-forgotten Unbreakable. I’m all fairness, I do have great appreciation for Shyamalan’s ability to take basic notions and run with them. If someone’s mental beliefs have the capacity to alter their physical composition (for example, someone who is stressed can make themselves sick), then why couldn’t someone have multiple personalities and have one that believes itself to be a strong, savage beast and physically change when that persona comes to the foreground of their mind? It’s crazy and extreme, but it’s a simple idea made big by the at-times-genius creator that is Shyamalan. To then take that idea, make a pretty good film about it (Split is 76% positive), make a great profit off of it, and connect it back to one of his best films was the ultimate twist-ending that nobody saw coming. 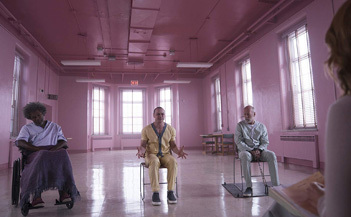 Though I’m praying the early bad reviews for Glass got it all wrong, there’s a chance that the biggest twist of all is that this thrown-together franchise ends up shattering Shyamalan’s reputation for good.